exams got over today. all, but one, were quite ok. i've decided not to think too much about that particular one right now. its over and done with, and i can't do anything till the results are out, which seems eternally away, especially since the vivas will get over only by 13th may. the photo is from a stall at the beach, from where we ordered the sandwhich and the pizza. in the photo are the ingredients for pav bhaji, as well as the finished dish. 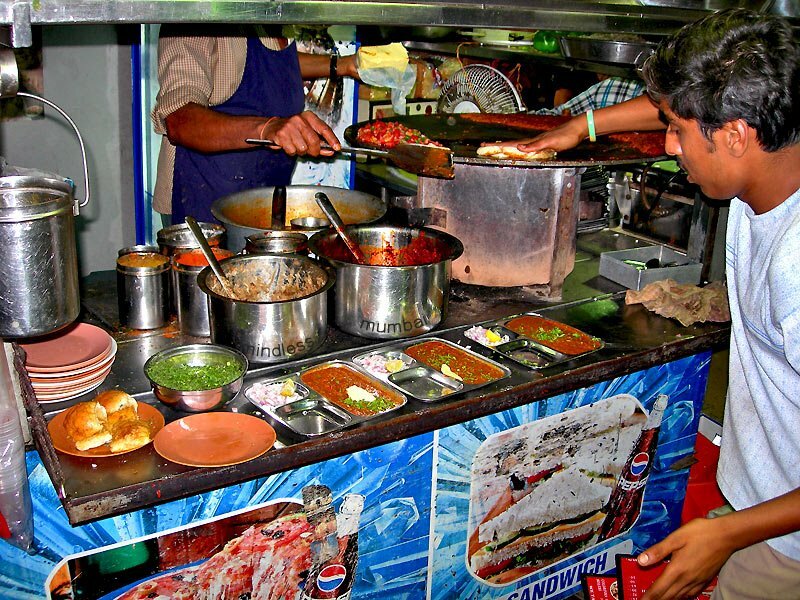 on the extreme right of the pan is the bhaji (veggies) which are continuously stirred and rotated, on the left is the mixture of tomatoes, onions, chillies etc, that goes into the bhaji; while the guy on the right is warming the pav (bread) in between these two. each of the three dishes in the front is the bhaji, topped with coriander leaves, and a handful of onions, along with a slice of lemon; and a dollop of butter. the two cooks had no objection to me clicking the photo, as long as the name of their stall was not clicked. that worked perfectly for me! I can almost smell the delicious, fragrant spices! Yummy, you sure had a great time eating there. I love the pav bhaji at the beach. Reading those activities that you did on the beach...especially on the chowing part...makes me yearn for food too...but it's almost midnite now! What a torture for me here!!! Great that you all are taking a good off time! I know how exam stress is like! Glad I am over with that! Looks delicious. Especially since I just watched an episode of Anthony Bourdain's No Reservation which takes place on Mumbai. Now, I am doubly hungry. All the best with your exams. Now you can relax! !